In addition to meeting for Holy Communion, Christians have, since the earliest times, also met for Sunday and weekday worship which does not involve Holy Communion. The system became more elaborate in the religious communities which sprang up from the third century onwards, and it may have taken its inspiration from a line from Psalm 119 (verse 164): “Seven times a day I praise you for your righteous ordinances”. The “Hour Services” consisted of Matins and Lauds at midnight, Prime in the early morning, Terce, Sext and None at the third, sixth and ninth hours (roughly 9 am, noon and 3 pm), Vespers in the evening and Compline at bed-time. Much of these services consisted of recitation of the psalms (all 150 were used every week). Matins was the only service which had readings of any length from other books of the Bible, and sometimes these would be replaced by stories (often not much more than legends) about the lives of the saints. These services continued in much the same form for over a thousand years. It later became compulsory for the clergy to say all the Hour Services every day, for which they had a book called a Breviary. Sometimes lay people would also join in. Thomas Cranmer, Archbishop of Canterbury at the time of the English Reformation, drew on this inheritance in devising two services which would be for both clergy and lay people: he included parts of Lauds and Prime into Matins (or Morning Prayer), and combined Vespers and Compline to make Evensong (or Evening Prayer). The psalms were used once a month rather than once a week, and the other Bible readings were arranged so that nearly the whole Bible was read during the course of each year. This system was brought into use in the Book of Common Prayer in 1549 and was largely unchanged in its revisions of 1552 and 1662. Again, all priests were expected to say Morning and Evening Prayer every day, and if they were at home they were expected to do it in church, so that others could attend. We have come together in the name of Christ to offer our praise and thanksgiving, to hear and receive God’s holy word, to pray for the needs of the world, and to seek the forgiveness of our sins, that by the power of the Holy Spirit we may give ourselves to the service of God. On Sunday evenings at St John’s at 6 pm we use the Book of Common Prayer version of Evening Prayer, usually with hymns and a sermon too. The whole service usually lasts about 40 minutes, and takes place in the choir stalls. You would be very welcome to join us. Further information about daily prayer on the Web. 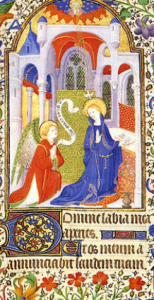 The picture is from a Paris Book of Hours of about 1410. It contains the opening words of Matins (in Latin): O Lord, open my lips and my mouth shall show forth your praise (Psalm 51.15) (courtesy: Wikipedia). The texts of Morning and Evening Prayer for which there are links above are provided by the official Church of England web site, © The Archbishops’ Council of the Church of England, 2002-04.